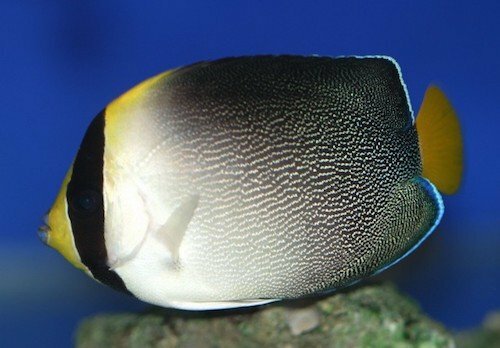 The Singapore Angelfish Chaetodontoplus mesoleucus or sometimes called the Vermiculated Angelfish is an impressive looking species of saltwater angelfish. It has a very tall, flat, rounded body with a compact face. The coloring is particularly striking, with a shimmery silver body, blue lips and a dark vertical strip that runs though the eye. In the wild, the Singapore angelfish is found in the Indo-West Pacific from southern Japan to Indonesia. The Singapore angelfish grows to approximately 7 inches and because of this, the recommended tank size is 100 gallons or larger. In its natural habitat, the Singapore angelfish calls barrier and fringing reefs home and you’ll want to replicate this environment in the home aquarium if you want the fish to thrive. These fish don’t school, but are often seen in pairs or sometimes a male will keep two females in his territory. Females tend to be passive while the males are known to be aggressive. The Singapore angelfish is notoriously difficult to keep in the home saltwater aquarium. Common complaints are that the fish won’t eat when placed in its new environment. Some people suggest that you look for a fish that is ‘fat’ and eating a healthy diet before bringing it home. Be wary of a Singapore with a pinched belly because it could indicate that it’s not eating properly. Because they can be so difficult keeping in the home, water quality and keeping on top of regular maintenance is vital for keeping the Singapore angel alive and well. It’s mandatory that you put this fish in a well-established tank that has plenty of rock work to give it ample hiding places. 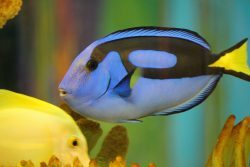 In addition, this fish likes to graze on algae in the wild, so having that available when you introduce them to your tank will help the adapt. Most experts recommend having a good crop of algae ready for it when you bring it to its new home. As mentioned, you’re going to have to be vigilant about water quality to keep this fish happy and healthy. In the wild, the Singapore angelfish prefers a water temperature between 76˚ – 82˚ Fahrenheit, a pH of 8.1 – 8.4, medium water hardness of around 8 – 12 dKH, and specific gravity of 1.023 – 1.025. It’s recommended that you perform bi-weekly water changes of 10 – 15%. They’re not picky about substrate and should adapt to whatever you currently have. Lighting can be normal, although you might consider adding some stronger lighting in key tank areas to encourage algae growth if you’re having difficulty. 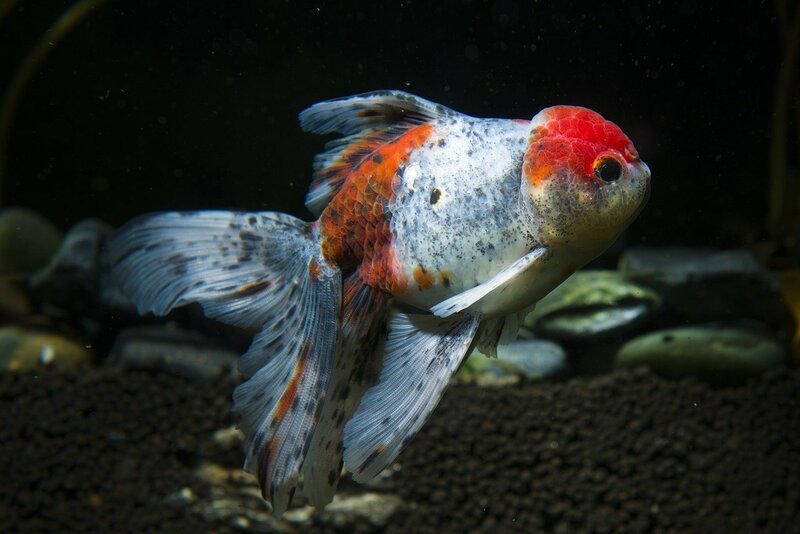 As we described, the males can be particularly aggressive although each fish has their own unique personality. People have reported their Singapore angelfish terrorizing virtually all of their tank mates, while others only seem to want to protect their territory. Take this into consideration if you’re putting this fish in a community tank that has much smaller fish as they may become targets or become too intimidated to come out of hiding and stop eating. 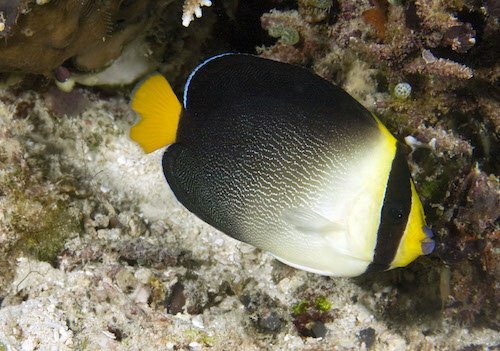 Most experts agree that you can house this fish with other saltwater angelfish, but only if you have a large enough tank — 250 to 300 gallons — so they’re not overlapping territories. Also, be careful not to put juveniles together in the same tank as they’ll fight. Note that the Singapore angelfish isn’t entirely reef friendly and will feed on corals and invertebrates, however if you house them in a big enough environment, your coral should be safe from being destroyed. Once you get past the initial trial of getting this fish acclimated and eating in your tank, it’s a pretty hardy fish and should do well provided you’re keeping on top of water quality and performing regular water changes. 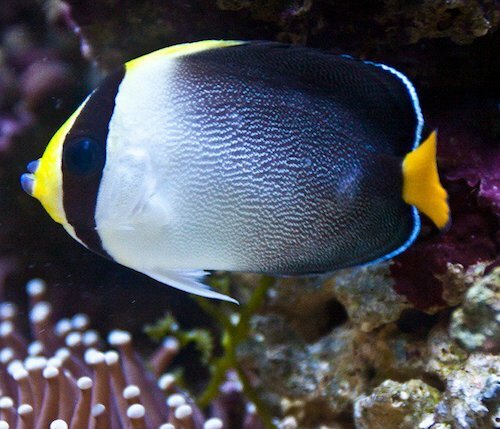 However, like most species of saltwater angelfish, the Singapore angelfish is prone to many of the diseases that can lurk in saltwater environments. Stress, like with most fish, is perhaps the number one cause of disease. This stress can come from being housed with unsuitable tank mates or by poor water conditions. Stress causes the immune system in these fish to weaken, which makes them more susceptible to disease and other ailments. Do what you can to keep these fish calm, give them good nutrition and provide them with plenty of places to hide and they should be happy. Having said that, there are a few diseases that the Singapore angelfish is prone to getting and those include White Spot Disease or Marine Ich, Saltwater Ich and Crypt, which is the most common. 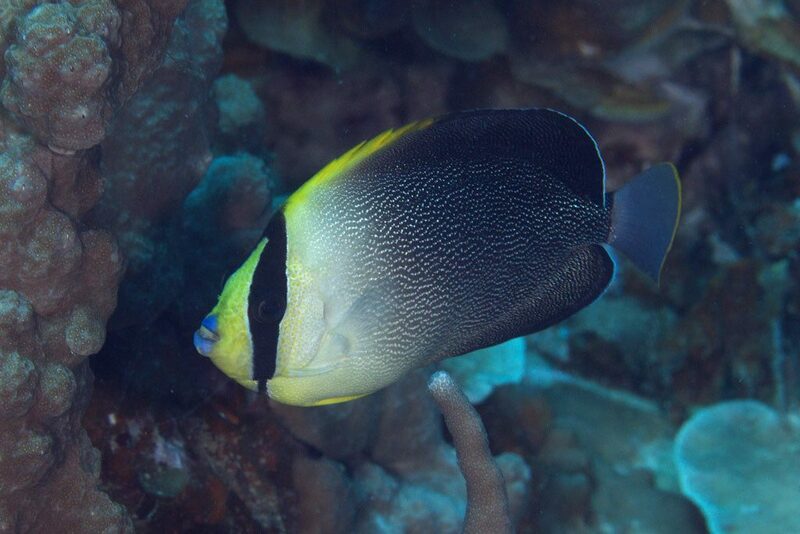 In the wild, the Singapore angelfish, like most saltwater angelfish, are omnivores and they eat mostly benthic algae and weeds, but also like to dine on sponges, tunicates and sea squirts. 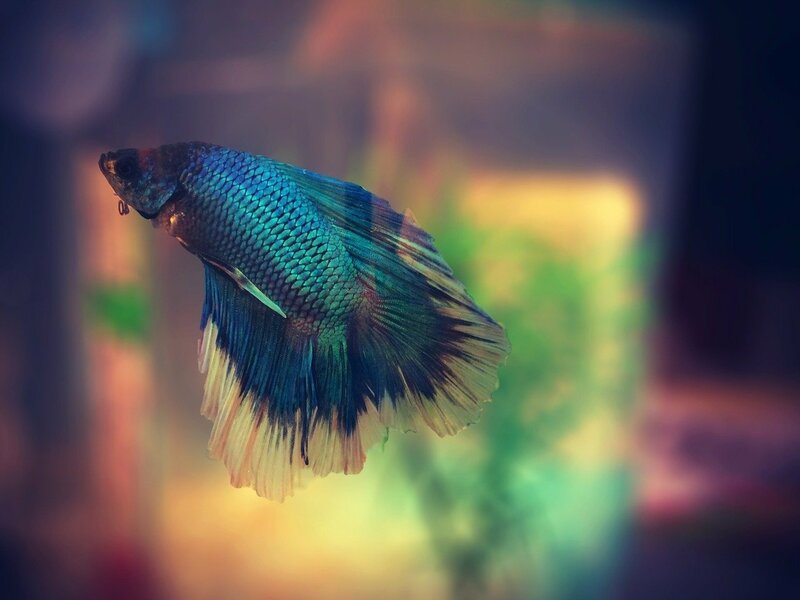 At home, you’ll better your chances of keeping this fish healthy if you feed it a varied diet that includes frozen, flake and freeze dried foods. You can also add in shrimp either frozen or fresh to their diet. To ensure your chances of success with this fish, make sure you have a nice crop of algae waiting for it to encourage it to feed. Also, try offering live food if you can. Most people agree that if you can get over the initial hurdle of getting the fish to begin eating at home, you should be ok. Experts say it’s not uncommon for the fish to go a week or a little more without eating, so don’t panic if it doesn’t immediately take to eating. Once they do start eating, feed them 3 times a day. The Singapore angelfish hasn’t yet been bred in captivity.